We are all about sharing our passion for Antiques, Collectibles, "Vintiques," Vintage items, and just Plain Old Funky Junk. Do you like to hunt for treasures? Do you love artfully crafting someone else's junk into a piece of beautiful decor for your home? Or, are you passionate about the classic elegance of fine antiques, glass, silver, or china? Do you love the beauty and history of these items? Do you artfully, lovingly display them, hunt for them, and maybe even make some money selling them? 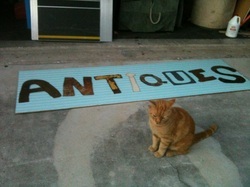 If collecting and/or creating antiques, vintiques, or even mantiques you will want to visit us soon. If REPURPOSE-RECYCLE-REUSE-REINVENT-OR RECREATE is music to your ears then Cooper City Antique Mall is the store for you.